I am a lawyer, activist, and professional troublemaker that photobombed former Equifax CEO Richard Smith in his Senate Banking hearing (https://twitter.com/wamandajd). 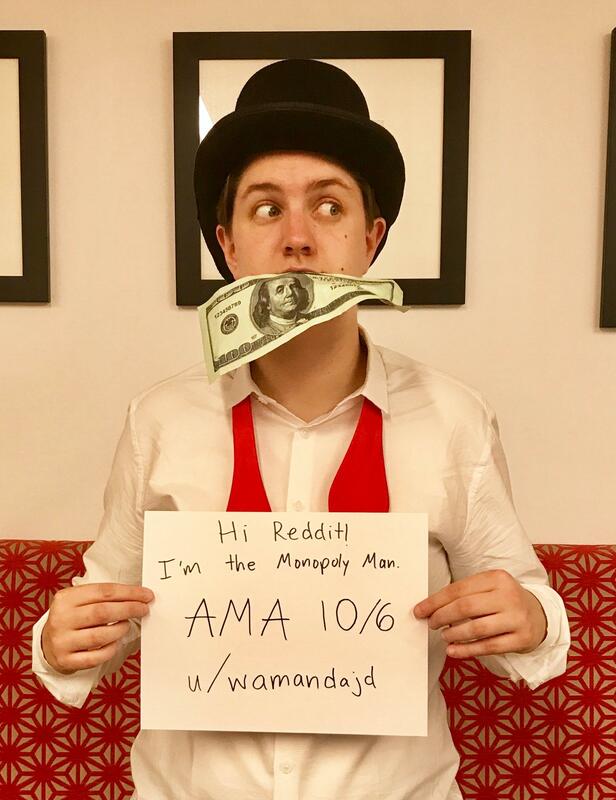 I "cause-played" as the Monopoly Man to call attention to S.J. Res. 47, Senate Republicans' get-out-of-jail-free card for companies like Equifax and Wells Fargo - and to brighten your day by trolling millionaire CEOs on live TV. Ask me anything! To help defeat S.J. Res. 47, sign our petition at www.noripoffclause.com and call your Senators (tool & script here: http://p2a.co/m2ePGlS)! ETA: Thank you for the great questions, everyone! After a full four hours, I have to tap out. But feel free to follow me on Twitter at @wamandajd if you'd like to remain involved and join a growing movement of creative activism. As many people have pointed out, the Monopoly man doesn’t actually wear a monocle. Are you going to modify your costume to stay true to the original or is this your take on the Monopoly man? Do you have any other costumes? Will you continue with Monopoly man for any other events? 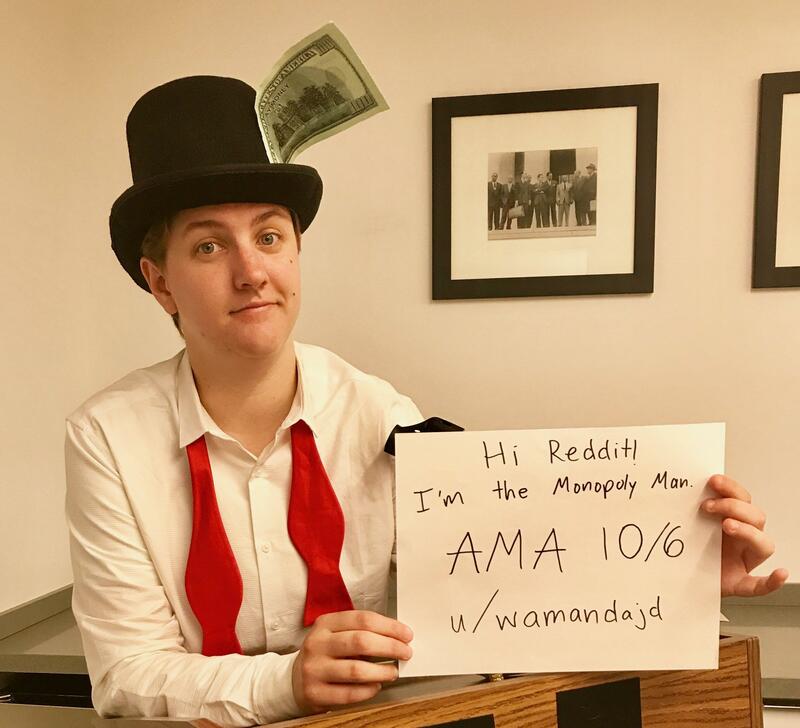 Why did you pick Monopoly man? How do stunts like this advance your activism? How much more attention did you get this week compared to playing it straight in the past? Hasbro's Monopoly Man may not wear a monocle, but this one does. When doing physical comedy, you don't turn down a hilarious prop. The only other costume I currently own is a Furby costume that I wore as a joke in high school. (We'll see if that one makes it into any hearings...) But I am open to buying/making other costumes as needed, to fit the activism. Stunts like this bridge the gap between entertainment and activism. If done right, creative protest can be far more effective than traditional advocacy. The rise of Trump shows the power of entertainment. But while Trump's antics are nihilistic at best (and insidiously oppressive), there is no reason progressive messages cannot be delivered in a way that is both entertaining and effective. See Charlie Chaplin, for one. Even though most entertainers have fairly progressive politics, there is a reluctance to embrace art - especially comedy - as activism. That is a major tactical error, in my opinion. The attention my campaign to support the CFPB arbitration rule got this week is unlike anything I have ever seen. Traditional tactics are necessary to shape policy, but we need to be willing to take big risks if we want to see major reform. I expect the Monopoly Man will rise again, when the people of Gotham need him most. I work for a progressive nonprofit in DC that also does work on Tax Reform so I'm thrilled to see S.J. Res. 47 getting the attention it needs! My question is: Where did you get the idea/ovaries to pull this off? But it was my idea to try to photobomb the hearing in character. I have sat in hearings before (not in costume) and noticed myself in shots on C-SPAN, and I have always been a shameless agitator. So it seemed like a natural fit to combine my comedic talents and irreverence with our activism here. Luckily, my bosses gave it the green light! I have some things in the works. You have not seen the last of the Monopoly Man, and definitely not the last of me. Follow me on Twitter @wamandajd if you would like more shenanigans. The issues closest to my heart are racial and economic justice (must be both, not either/or), corporate accountability, and queer/trans rights. In general, we must fight all forms of oppression and empower people with enough freedom and access to resources to have control over their own lives. I think that philosophy applies to most progressive issues.